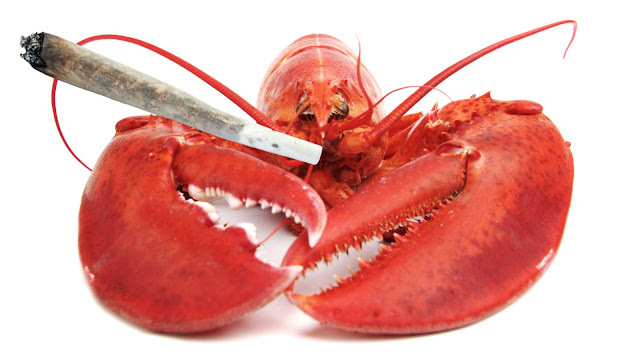 A US restaurant is using marijuana to sedate lobsters before killing them. Charlotte's Legendary Lobster Pound, a restaurant in Maine, says the process is more humane as it lessens their pain before death. Lobsters are often cooked by being dropped into a pot of boiling water, seen as cruel by some. There is growing evidence the crustaceans feel pain. The restaurant's owner, Charlotte Gill, says about why she chose to "hot box" lobsters. "I feel bad that when lobsters come here there is no exit strategy," Gill said. She first tried the technique on a lobster named Roscoe. Roscoe was placed in a box with about two inches of water. Marijuana smoke was blown into the water through a hole in the bottom, and Roscoe got "baked." Marijuana is legal in Maine and Roscoe seemed to enjoy his first time getting high — he was much calmer when he was put back in the tank with other lobsters. As a reward for his participation in the experiment, the lobster was returned back into the ocean, Gill said. Customers at the restaurant can choose whether they want the marijuana-sedated lobster or not. The owner of Charlotte's Legendary Lobster Pound, Charlotte Gill, says eating the sedated lobster will not make customers high and using marijuana leads to better quality meat, as the animal is more relaxed when it dies. "If we're going to take a life we have a responsibility to do it as humanely as possible," Ms Gill told local newspaper Mount Desert Islander. "The difference it makes within the meat itself is unbelievable." Marijuana is legal in Maine and Ms Gill has a license to grow and supply it for medical purposes.